This property is directly associated with the initial period (1902-1920) of downtown commercial expansion that occurred due to local economic prosperity after the Klondike Gold Rush and in tandem with explosive population growth and suburban residential development. During this era, modern urban architectural scale began with the construction of the earliest steel-frame highrise buildings and the establishment of a concentration of banking enterprises and department stores along Second Avenue from Cherry Street to Pike Street. The initial regrading of Denny Hill and the commercial redevelopment of the former University Grounds (University/Metropolitan Tract) were major factors that facilitated northward and eastward commercial expansion. In 1914, the owners of the Frederick and Nelson Department Store purchased property with the intention of building a large, five-story store at Fifth Avenue and Pine Street, thus solidifying the location of the future downtown retail core. A significant number of extant commercial properties dating from this era remain within the downtown commercial core, including: numerous hotels, several business blocks and early highrise commercial buildings, as well as specialty and department stores, apartment houses and theaters. The concept of the modern hotel that would include private rooms, toilet and bathing facilities, public spaces and related guest services, originated in the early nineteenth century. By 1853, the settlement community of Seattle included its first hotel, the Felker House. By the later part of the nineteenth century, Seattle - like cities throughout the United States - included a significant number of hotels that served a wide variety of business travelers, tourists and both permanent and semi-permanent residents. By the late 1880s several elegant hotels as well as workingmen’s hotels were clustered along the west side of First Avenue between Cherry and Columbia – in proximity to the original railway passenger depot. Urban hotels, lodging and apartment buildings all closely resembled commercial office buildings in the 1880s and 1890s; it was not until the 1920s that hotel design became distinctly different in exterior appearance. Early hotel development was clearly stimulated by improvements in railroad service that brought immigrants and drew tourists and entrepreneurs. Prior to the fire of 1889, the Occidental – Seattle Hotel (1864, 1887 & 1889, destroyed), was the city’s premier tourist-oriented hotel, although there were numerous other hotels located within the commercial district. At least a dozen hotels were destroyed in the great fire of 1889; however, within four years some 63 hotels were in operation. By the turn of the century, tourist and residential hotels lined the west side of First Avenue to Pike Street. Based on the number of hotels that were operating in Seattle by 1900, it is certain that they mostly catered to long-term residents rather than temporary visitors. Many buildings that were identified as hotels actually functioned as lodging houses or apartment hotels. During the late nineteenth and early twentieth centuries, hotel living was particularly common especially in the developing cities of the American West. Hotels varied significantly in size and accommodations provided and served every economic level from those of wealth to recent immigrants and transient salesmen and laborers. Given the tremendous population growth in Seattle after 1902, hotels and lodging houses played an important role in absorbing a new and largely transient populous. Family-style hotels were designed to include suites of rooms that would be used by individuals who needed especially comfortable long-term accommodations for their relocated families or those who traveled regularly but maintained a principal residence elsewhere. While large resort or tourist-oriented hotels are noteworthy, the great majority of hotel buildings built after 1900 and prior to the 1920s were much more modest operations. A particularly significance boom in hotel development occurred between 1906 and 1910 in conjunction with local economic opportunities and population growth as well as the opening of the Alaska-Yukon-Pacific (AYP) Exposition of 1909 that drew some 3.7 million visitors. By 1910, Polk’s Directory included over 475 hotel listings. Particularly noteworthy family-style and luxury hotels constructed during this era include: the 12-story Savoy Hotel (1906, destroyed) on Second Avenue near University Street; the New Washington Hotel (Josephinum, 1908) and the Moore Hotel and Theater (1907), both built after the initial regrade of Denny Hill; and the Frye Hotel (1910) at Yesler Way and Third Avenue located near the new passenger railway facilities at Jackson Street. Such well-appointed hotels would typically include comfortable lobby areas, restaurants, event and meeting rooms, and provide special housekeeping, laundry and meal services for their guests. Other extant tourist-oriented and residential hotels constructed in the expanding commercial district during this era include: the Millburn Hotel (1902, altered); Sterling Hotel (1903, altered); Irwin Hotel (Green Tortoise Hostel, 1905, destroyed); Kingsbury Hotel (Glen Hotel, 1907); Raleigh/Imperial Hotel (1907, altered); Riopath Hotel (1908, altered); Shirley Hotel (1908, altered); Elliott Hotel (Hahn Building, 1908); Oxford Hotel (1909); Madrona Hotel (1909); Hotel Larned (1909); Nelson Hotel(Commodore,1909); Archibald Hotel (St. Regis, 1909); Hotel Afton (Atwood Hotel, 1910); Calhoun Hotel (Palladian, 1910); Crouley Building/Reynolds Hotel (1910); and the Governor/Rector Hotel (St. Charles, 1911). During the 1920s, a second boom in major hotel development occurred at which time several luxury hotels and large apartment hotels were built in the downtown commercial district. The national economic collapse brought on by the Great Depression during the 1930s brought downtown real estate development to a virtual halt. Old hotel buildings in Pioneer Square as well as those lining First Avenue and near the Pike Place Market provided cheap housing and services for an increasingly transient and displaced low-income population, a pattern that continued into the late 1960s. A tragic fire in 1970 prompted revisions to the city’s fire code and new fire safety measures forced the closure of many residential hotels and displaced thousands of low-income residents and service providers. As a result many of the older residential hotels were either demolished or remained vacant and unused for many years. The Kingsbury Hotel was built in 1907. Limited information regarding the history of this building and the circumstances related to its construction has been uncovered. Neither the architect, nor builder, of the Kingsbury Hotel has been identified. In 1994-95, an extensive $2.5 million renovation was undertaken in order to transform the hotel into low-income single-resident housing units. The architects for the renovation project were Stickney and Murphy. This is a partially intact example of a common downtown hotel property type from this era. It is a modest example of hotel design in comparison with other extant like properties. 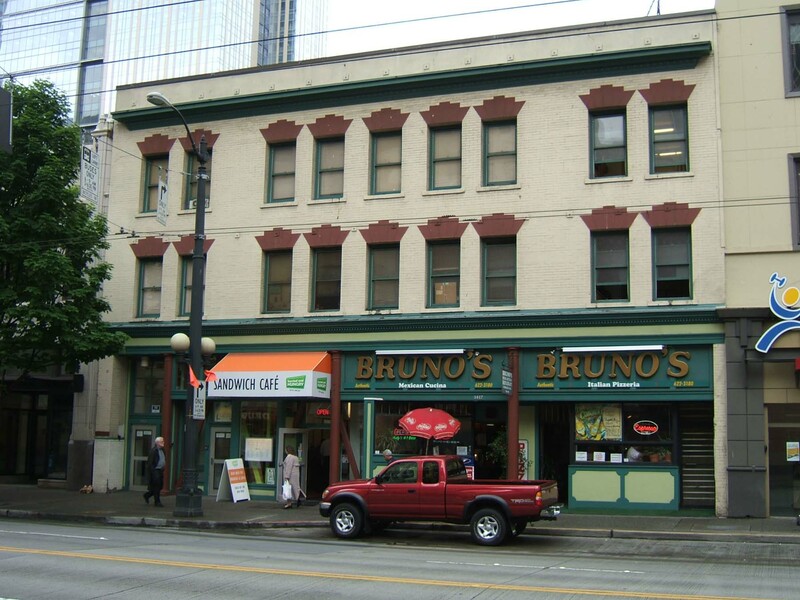 Located mid-block on the west side of Third Avenue between Union and Pike Streets, this three-story hotel building (with a concrete foundation/basement) originally included one retail store and 44 hotel rooms. The upper floors now house low-income housing units while the ground floor continues to be used for retail/restaurant purposes. The building measures 60’ x 111’ and exhibits a two-part commercial block façade composition. The ordinary masonry structure includes a concrete foundation and basement and is clad with buff-color painted brick; cast stone voussoirs have been painted red to accentuate upper two floor level windows. The upper floor levels are divided into three bays; a central bay with five individually set window openings flanked to each side by sets of similar window openings. The simple unframed rectangular window openings with prominent painted voussoirs hold 1/1 double-hung sash that appear to be rehabilitated original windows. The building is capped by a parapet coping and a narrow, non-historic cornice element. The storefront level is capped by an intermediate sheet metal cornice that may be original; however, the entire retail storefront has been modernized and does not appear to include any historic building fabric. Some historic tile finishes remain in place within the entry vestibule at the south end of the façade. There do not appear to be any intact or architecturally significant interior building features, finishes or public spaces. Request for Determination of Eligibility, prepared by DON Urban Conservation, December 29, 1993.